It seems our equipment has been captured by the Google satellites working away in Chiswick last year. If you visit W4 5XU on Googlemaps you will see building No 7 of the Chiswick Park development in the process of being built. 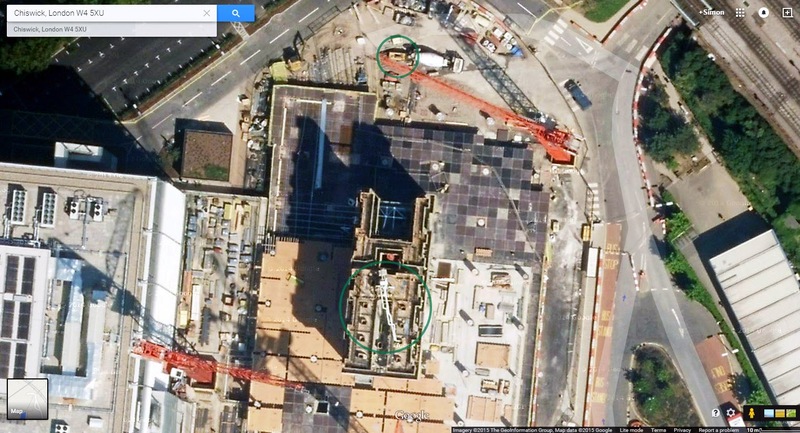 Circled above are the low emission Schwing SP2800 static pump and the SPB30 placing boom used to build the new 12 floor, 31,000 m2 building designed by Rogers Stirk Harbour & Partners. Thanks to Andrew from Camfauds who kindly alerted us to this. They were supplying the Schwing concrete pumping equipment to Careys who had the contract for the building. The structural work was finished earlier this year and building No 7 is currently being fitted out and should be ready for new tenants towards the end of the year.